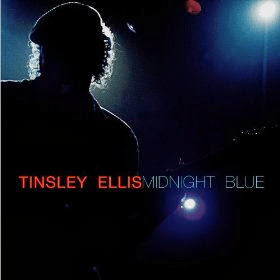 Just received the newest release (January 14, 2014), Midnight Blue, from Tinsley Ellis and it's a smoker! Hot on the heels of instrumental release Get It!, Ellis comes hot out of the chute with If The River Keeps Rising, opening easy with vocal and acoustic guitar but then letting the dogs out with overdriven electric guitar and solid bottomed bass and drums. Fat slide solo's always make me happy and this is a good one! On Mouth Turns Dry, Ellis uses a classic blues rhythm (The Hunter) with a twist and a forward driving blues rocker with solid vocals and frenzied guitar work. Super track! Surrender has a smoother radio play style with nice bass lines from Ted Pecchio. Solid R&B style blues giving Ellis a great opportunity to show his fluid chops. It's Not Funny has a Louisiana beat and sound with cool resophonic slide sound. This is a cool take on the New Orleans sound and pianist Kevin McKendree and drummer Lynn Williams creat a great theatre for this funky track. See No Harm is a rich slow blues track with gospel like piano work....excellent. Ellis digs in for some of his most soulful guitar riffs in a long time and his vocals are complimentary to the nearly perfect track! The Only Thing is a really nice track with a basis similar to Dixon's (Jeff Beck's) Ain't Superstitious. This more modern take with a new twist (it is really a different track altogether) is a a nice groove and Ellis really has it going. Peace and Love has a real warm homey feeling with interesting key work. I like Ellis' vocal work on this track which has a strong melodic hook and hot guitar riffs. That's My Story has a country / blues// rock sound with a twist of Dire Straits. The most straightforward rocker on the release, Ellis lays down some really nice rock riffs and stretches his legs a bit. My favorite track on the release, and also the closer, is Kiss of Death. This is a really smokey hot blues track... think Blue Jeans Blues (ZZ Top). If you don't like this... you don't love modern blues! This is a spectacular ending to a very well done release!